It's Time for Miis to Fight Back! Nintendo has a history of neglecting IPs, leaving them filed away with fans clamoring for the next iteration. F-Zero is the most prominent example of how a beloved IP gets lost between the pages of bigger titles, having not seen a major release since the Gamecube era. Some Nintendo properties aren't actually forgotten though, just misused and underrepresented. The Nintendo Mii could be one of Nintendo's biggest under appreciated mascot, and I think it's time Nintendo tried to change that. Nintendo released the Wii and Wii Sports with a legion of avatars used to represent the human player, and while they aren't nearly as recognizable as Mario or Pikachu, they hold a place in every Nintendo lover's heart. Miis have taken the roll of extras in many first and third-party games, a few main rolls in the 3DS Streetpass games and Nintendoland, but Super Smash Bros. is where the Mii's fighting spirit finally shines. They weren't just used as lenses to explore the world of other games; they became actively engaged in those worlds, interacting directly with it's characters. It isn't as if the Mii universe hasn't already been fleshed out a bit. Wii Sports has given us the beautiful Wuhu island and lived through them in Tomadachi Life. We've seen their varied skills in Smash, Kart, and Nintendoland. Even then we know there's no reason they need to be tied to their own world. It's time to let them explore Brinstar, DK Island, or even the Mushroom Kingdom! Let them use Samus' arm cannon and DK's tie as equipment, and have them fight the enemies from those worlds to save their own. We know how well Miis lend themselves to RPGs thanks to the Streetpass Games and DLC on the 3DS. Shouldn't the next step be something that combines all these elements into a fully realized package? Nintendo could explore new and innovative RPG elements without the limitations of established worlds and characters! Miis choose a fighting style, similar to Smash: Ranged, Brawl, Sword. Maybe add Heals and Rogue for good measure. Wuhu Island is the hub world, and Miis enter other worlds via an ancient portal. Obvs classic RPG fighting; Villains and enemies from other games. Story might revolve around other game heroes kidnapped and Miis need to save them (think Subspace Emissary from Brawl). Add Amiibo support: Take your Mii to adventure on a friend's console! What do you think? Is this somewhere you'd like to see Nintendo take Miis, or are their efforts best directed to other franchises we haven't seen in a while? 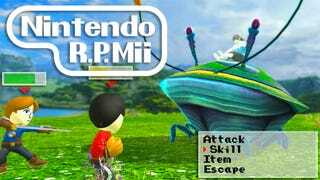 What elements should/could an R.P.Mii explore? What other ideas do you have for Miis? Let us know in the comments!